You're an awesome, unique individual-shouldn't you dress like one? Boldfoot Socks are designed to shatter the drab stranglehold that men's fashion has on your feet and open up a whole new world of self-expression. Show off your patriotism, school colors, sports fanaticism, or plain-old personality with a wild array of bright, vibrant colors and patterns. Our socks are designed to fit US shoe sizes 8-13 for men and 9-15 for women. Boldfoot Socks start out as American Supima cotton, grown right here in the continental U.S. The cotton is turned into yarn and dyed just outside of Charlotte, N.C., and then becomes socks at our factory outside Philadelphia. You won't find any third-world sweatshops or carbon-heavy overseas shipping in our supply chain. Every purchase you make is putting people to work right here in the USA. We trust our socks so much that we'll offer 3 months of Sock Insurance on any purchase-if they tear, run, rip, or develop holes at any point in the first 90 days, we'll replace them-no questions asked. And if for whatever reason you may not be happy, we offer a 100% SATISFACTION GUARANTEE. Just let us know what may have gone wrong and we'll issue a full refund. We've been dedicated to serving our community from the very first days of Boldfoot's existence. Not only are all of our socks 100% American-made, but 5% of all profits support organizations that take care of Military Veterans. By keeping your feet warm, you'll also help put a roof over a homeless Veteran, find a job for the unemployed or improve the health of a Vet in need. Don't wait-order your pair today! STAND OUT FROM THE CROWD: Draw attention with fun, happy, colorful, crazy, cool and funky patterns that no one can match! A PERFECT GIFT IDEA FOR GUYS: Don't know what to get your Son, Father, Husband, or Secret Santa? We've got you covered with this amazing 3 pack. PREMIUM AMERICAN-MADE QUALITY:Manufactured in North Carolina, and made with American grown Supima Cotton. Boldfoot socks are American through and through. 3 MONTHS OF SOCK INSURANCE INCLUDED: If your Boldfoot socks rip, tear, or develop holes within 90 days of buying, we'll replace them with a brand new pair, no questions asked. 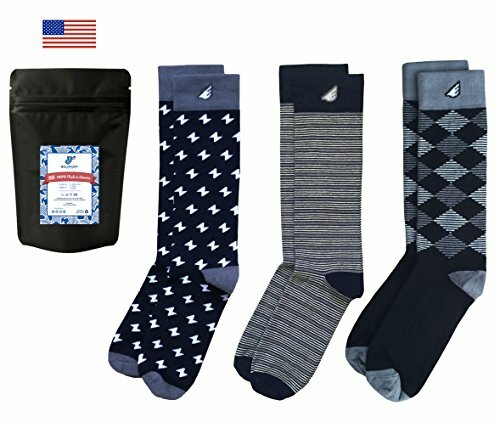 YOUR PURCHASE BENEFITS U.S. VETERANS IN NEED: 5% of all profits from Boldfoot socks go directly to organizations that assist Military Vets in need of jobs, housing, improved health and more. View More In Dress & Trouser Socks. If you have any questions about this product by Boldfoot Socks, contact us by completing and submitting the form below. If you are looking for a specif part number, please include it with your message.